Our two bedroom three bath beach home with a bunk area is a comfortable residence with plenty of room for up to 8. We selected this beach property because we think it’s a perfect place for our family, our friends and other folks who are looking to have a memorable family vacation. The living space is very comfortable so you won’t feel cramped when you’re in the property. There is a warm earth toned tile in the kitchen and hallway with matching carpeting in the living room and bedrooms. The balcony comfortably seats 4 and offers breathtaking views of the world’s most beautiful beach and the Emerald green waters of the Gulf. You'll want to spend a lot of time here because you have wonderful views of the beach and gulf. You’ll want to enjoy your morning coffee out here. And make sure you take time to enjoy the perfect sunsets over the world’s most beautiful beach. Tidewater 313 is a special place for us and we want to make sure it’s just as special for you and your family. We want to see you come back year after year. 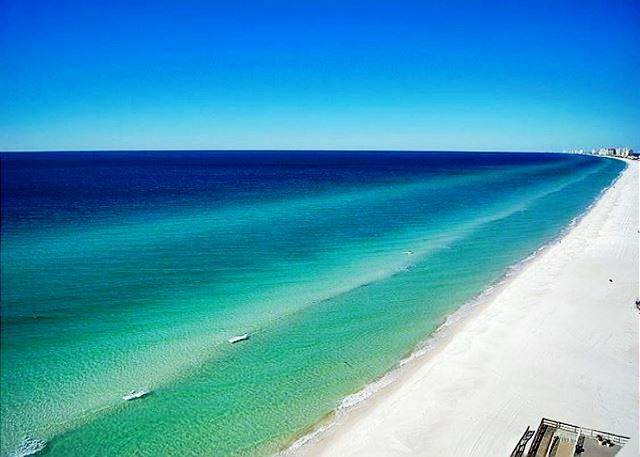 f you are looking for a great location for your family in Panama City Beach Tidewater 313 is just the place for you and your family to enjoy a truly memorable beach vacation. This condo is so popular it rents most of the year so if you want to make sure your family has the luxury beach vacation they deserve call or email our rental manager soon. It might not be available later.